Audible.com is one of my favorite websites. 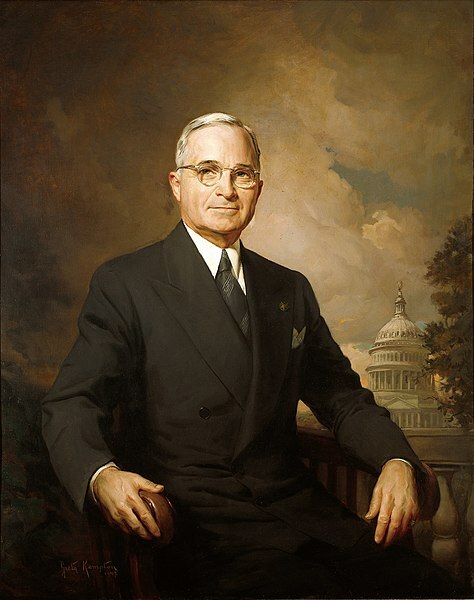 The accomplishments of the 33rd US President, Harry S Truman, and the methods he used to achieve them are a great guide for the increasing complexity of the modern world. Truman spoke clearly and did what he thought was right. 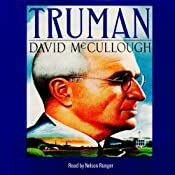 I just finished the 54 hour David McCullough biography of President Harry S Truman. Having been on a biography kick lately, my interest in Truman grew out of some exposure to the surveillance challenges faced by Eisenhower and the technology Eisenhower deployed to address those challenges. Having preceded Eisenhower in the White House, it was fascinating how different the two administrations used technology to face challenges. Official Presidential Portrait, via Wikimedia. Served in the artillery in World War I. As a senator his “Truman Committee”, formed in 1941, would make sure that US Industry focused on winning the war, not maximizing their profits. Chosen to serve as Vice President to an ailing Franklin D. Roosevelt over the encumbent Vice President, Henry Wallace. Took over as President 82 days after the inauguration. The surrender of Germany on May 8, 1945. Attended the July Potsdam conference with Stalin and Churchill, which would establish the geopolitical framework for the rebuilding of Europe. Decided to drop the Atomic bomb on Japan in August 1945. Oversaw the de-militarization of the US economy including an awkwardly handled national railroad strike in 1946. The creation of the United Nations, including persuading Stalin to include the USSR. The Truman Doctrine, which called for the containment of Russian expansion. The creation of the Marshall Plan, which called for the re-industrialization of Western Europe. The consolidation of the Navy and Army under the Secretary of Defense, the creation of the US Air Force and the CIA. The Berlin airlift, which avoided confrontation with Russia. Recognition of Israel as a state. Won his own election in 1948 with an audacious ‘Whistle-Stop’ tour that covered over 20,000 miles – directly appealing to the people. This was one of the greatest failures of modern poll-making, as his Republican opposition, Dewey, was heavily favored. He ordered the integration of the armed forces. He mobilized and stopped the N. Korean invasion of S. Korea – entering the US into the Korean War. He encouraged MacArthur’s early bold actions in the Korean War, and then stepped in to ensure that the military was fully subordinate to the civilian government by firing MacArthur for insubordination. He saw the creation of the Atomic Energy Commission, ensuring civilian oversight of nuclear energy and nuclear weapons. After appointing Marshall Secretary of State, he watched as the Chinese communists won out over their corrupt Nationalistic opposition, which was eventually vanquished to Taiwan. He oversaw and did what he could to oppose the rise of Joseph McCarthy. He oversaw the rebuilding of the White House, which had fallen into disrepair. He survived an assassination attempt, appearing on schedule for a speech later that same day. Truman oversaw a clean-up of the IRS, which had begun the habit of taking bribes. He commissioned a sweeping survey of Civil Rights, which was to establish the legal framework for integration. 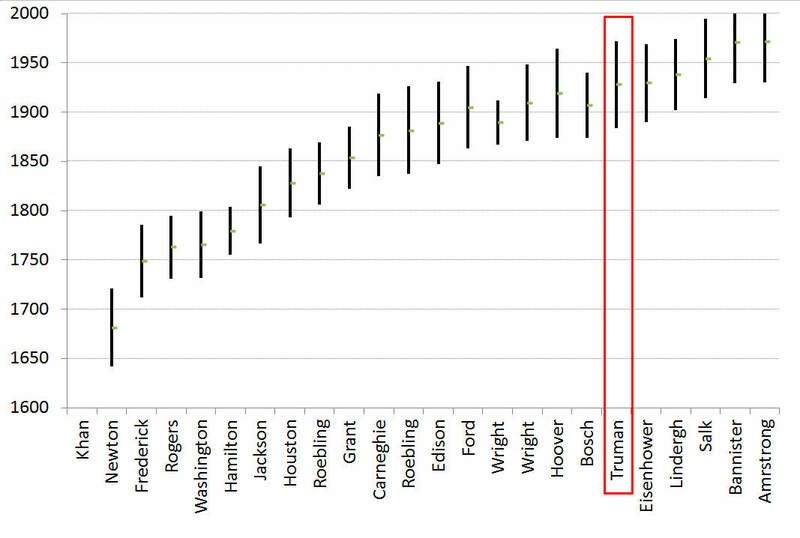 Truman (his lifespan highlighted in red) has a significant number of accomplishments, even when compared to an illustrious set of peers. Truman was a plain spoken man from Independence, Missouri – he fully believed that when presented with the true options, the American people would always make the right decision. It is refreshing to read about how his clear, direct communication was able to enable so many institutions and changes that continue to serve as institutions core to the modern world. This entry was posted in History, Uncategorized and tagged Atomic Bomb, Biography, Harry S Truman, History, Integration, President, United Nations, World War II. Bookmark the permalink.